Hello! I have a question – if i don’t want to use cheese (for some weird and unexplainable reason), should I increase flour quantity or no? So you know what my plans were for today? Yes, believe. MY BREAD’s no kneed loaf. I have NEVER made bread at home before. I feel yeast challenged and have watched others make this bread with ease. I have the yeast ready, the scraper, the pot and the book. and there you are and your nice loaf. I completely understand what you’re saying, Dana. It’s so hard to write about something that’s been blogged about to no end in the world of food blogs. But with this bread, you just can’t let it slip by without giving credit where huge credit is due. I’m actually quite thankful you wrote about it as I wasn’t aware Lahey had a cheese version of this bread, let alone a whole book about it. I’m heading to amazon right now to buy his book! Thank you! I LOVE bread, and this looks just AMAZING! I too hear such great things about no knead bread and about that book, and I really like baking bread, and I’ve never tried this! The only no knead dough I’ve ever made was the recent rye flatbread. I need to give this a go. Your bread looks great! Making no-knead bread has been on my list for awhile! I also need to by a Le Crueset pot, so I think that is why I have been holding off. BUT, when I do I am going to use your recipe, because cheesy bread sounds like the way to go! Friends, if you are looking to alter this recipe (i.e. leave out the cheese or use different flours), I would encourage you to either look at the original recipe – easily found by googling – or buy the book. I am not enough of a bread expert to figure out substitutions. Also, you DO NOT need a Le Crueset pot. I have friends who make it in a regular old pot (stainless even!) with no problem. I always forget about that bread, but I’ve loved it since 2008. I think baking in a dutch oven is genius even if you don’t make that particular bread recipe. I’ve only done the Healthy Bread in 5 and Artisan bread in 5 no-kneads before but your Jim Lahey bread looks INFINITELY better than any of my no-kneads ever did! Given my extreme lack of time lately, this is going to be put together tonight! Gorgeous bread, Dana…. Now, you do realize that in the very near future you will get your first sourdough starter going, don’t you? I’ve been baking no-knead bread in all kinds of variations and I put it in a baking paper (the brown one from whole foods) lined basket or colander or whatever you use to let it rise. When it is done rising I simply lift the whole thing with the paper and put it in the hot pot (with the paper). No mess – easy to handle. This looks really tasty, but since you have been making a lot of loaves lately, I really wish you would try your hand at the no-knead method in my Kneadlessly Simple book. As you will see, it is a bit different than the Lahey method–a little easier, I think. 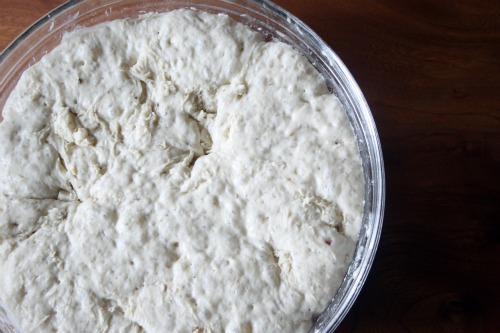 It also calls for a retarded first fermentation–which really just means that the dough is mixed with ice cold water. This retards the first rise, a step I think delivers exceptional flavor and color. I’ve got several of my recipes posted on my site–hope you’ll give one a try! 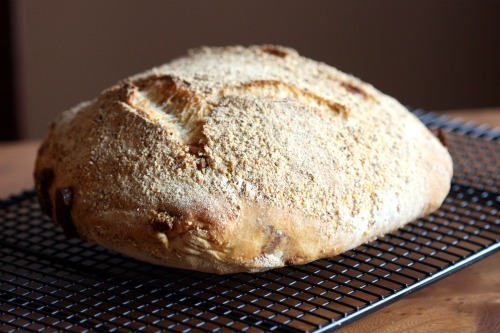 I love no-knead bread and usually use the Jim Lahey recipe out of How to Cook Everything. Somewhere along the line, I read that rather than let it do a second rise on a towel, you could use a sheet of parchment over a frying pan (for shape)and cover it with plastic wrap. Then,when it comes time to put it in the pot,you just take off the plastic wrap and plop the bread in the pot parchment and all. The odd time I’ve had the parchment make an indent into the bread but it sure makes the whole moving process a lot easier. I can hardly wait to try this cheese version – thanks! Yet another reason why I want to attend your classes! I have a fear of baking with yeast, but you make this bread sound so easy that I just may have to try to make it…and it looks soooooo good! I held out forever as well…but it’s too easy not to! Love the no knead bread. Here’s a link to my post sharing your post with Rosie Dreams readers. That is a perfect crust! I had some not so successful no-knead bread making experiences before but am willing to try again after seeing your photos! Oh wow this bread is delicious. I used an aged asiago cheese and it was amaaaaaaaazing!